Cracked bricks can be a sign of serious problems in a wall or a home, but they may also signal harmless settling or a single weak brick. Once you have solved stress issues or determined that there is no major structural problem, you can repair cracked bricks so that they look nearly whole. To patch cracked brick, mix mortar and coloring together to match the color of the brick as well as possible. Commercial mortar colorings are available at concrete or builders' shops. Spread the mortar over cracked and chipped brick and allow it to dry. This method works best for cracks high on a home or wall that cannot be closely inspected by most passers-by, since it is difficult to match colors exactly. Additionally, patches do not last as long as the original bricks and will have to be re-done at some point. A tube of clear silicone sealant is often a good solution for small, passive cracks in brick. Put the silicone in a caulking tube, and squeeze the sealant far into the crack. Either find an extra brick and scrape off some dust or scrape inside the crack before filling. Just after sealing the crack, blow the brick dust onto the silicone. The repair will blend into the wall. For slightly larger cracks, use flexible backer bar and masonry sealant. 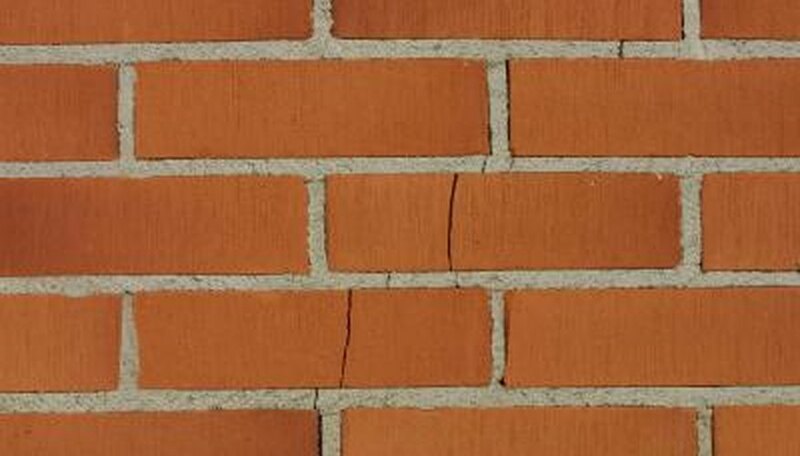 Do not use silicone or other caulk on old bricks, which are more porous, as this may cause them to crack further. Extra large cracks may be filled a little at a time with a mortar or group mixture. Clean the crack thoroughly and brush it with a wire brush to remove any debris. Use the same proportions of grout or mortar mix and water each day. Block the front of the crack so grout does not run out. Then with a funnel and a piece of rubber tubing, pour a thinned grout into the crack. Allow it to dry for 24 hours before adding more. Repeat these steps each day until the crack is filled. To finish, use a concrete paint the same color as the brick and touch up the areas of the grout repair that run through the brick. If you built the brick wall, pathway or home relatively recently, you may have access to replacement bricks. The simplest and best-looking way to repair a cracked brick is to simply remove it from the space, remove the mortar from around the brick, and repoint, or replace, the mortar around the brick.